It’s that time of year again and the post-apocalyptic Halloween displays have already been replaced with holiday cheer. As much as we’d like to think that we’re not ready for the holiday season to begin, some of us have already started making plans. With the big apple being right in our very own backyard, what better place to start than New York City? The possibilities are endless! The following activities would make perfect additions to your list of to-dos this holiday season. Aside from visiting Rockefeller Center, one of my very favorite places to go to during the most wonderful time of the year is The Winter Village at Bryant Park where you can shop, snack, and skate to celebrate the holidays. 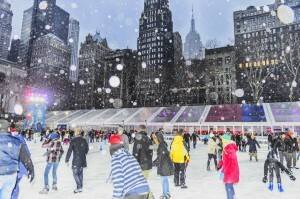 During the colder seasons, The Rink has become the epicenter of The Winter Village. Did I mention it is the only free admission ice skating rink in NYC? Of course, where there’s fun there’s food and Winter Village’s new rinkside bar and food hall is the perfect place for both. The Lodge offers an outdoor beer garden and a wide variety of eateries from Mayhem Smokehouse Sandwiches to my favorite, The Stackery, offering both sweet and savory chimney cakes. In case you were wondering, I like the Classic Nutella. With over 170 boutiques, The Winter Village outdoor holiday market offers local and artisanal food, captivating apparel, well-crafted gifts, and more. At the heart of Rockefeller Center, Radio City Music Halls Christmas Spectacular is a holiday staple. If you haven’t had the opportunity to experience The Rockettes live, now is the best time to! From the assortment of restaurants (10 to be exact) to stage door tours, you may want to arrive at least an hour, maybe two, before the show to get the full experience. You can go behind the scenes and take a guided tour of Radio City, frolic over to the merchandise and concession stands to purchase holiday souvenirs, or take a photo with one of the world-famous Rockettes or Santa Claus. Photo or it didn’t happen, am I right? Whatever you choose, there is something the entire family can enjoy. 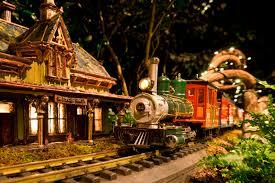 The New York Botanical Garden showcases a handful of their annual Holiday Train Show Programs during the holiday season. Re-created with bark, leaves, and other natural materials, replicas of over 150 of New York’s landmarks are displayed at the Enid A. Haupt Conservatory where moving model trains captivate the eyes of its viewers. From Bar Car Nights after dark to the Holiday Landmarks Tour where you learn of the Garden’s history and importance. Kids can experience the Family Film Series where you can see a showing of Polar Express, Frozen, and other holiday short films along with the Holiday Tree & Menorah Lighting Ceremony. This holiday tradition sells out fast so advanced ticket purchases are advised. So, before you wrap up your holiday to-do list this upcoming season (no pun intended) don’t forget to add these pit stops. These are holiday festivities that everyone can enjoy. Love NYC during Christmas. Great artical was a pleasure to read. What a great way to give information on some hot spots for the holidays. Thanks for the information I’m marking my calendar! Holiday Season 2018! The spectacular train exhibit at the NY Botanical Garden is one of our family favorites, along with the lighting of the tree in Rockefeller Center.